Maybe if I were a better planner this wouldn't happen, but every few weeks or so I hit a meal idea wall. Pasta? Just had it. Mexican? There is salsa running through my veins. Chinese? Indian? I don't wanna see another grain of rice for a while. Or sometimes, that wall is brought on by sheer exhaustion and dinner becomes whatever I can get on the table with minimal physical and mental expenditure. I'm sure you've had that kind of day. Pancakes for dinner, anyone? I made this quiche on a day like that. 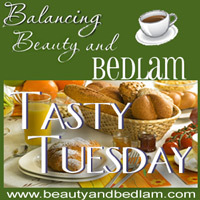 I felt bogged down after several days of either carb-heavy or meat-heavy or time-heavy meals. I had eggs and broccoli sitting in the fridge and a few potatoes starting to get particularly spuddy and no time to make a pie crust. Well, I thought, how about a crust made out of hash browns or home fries? This obviously performs as well as a breakfast or brunch dish as it does as dinner fare. I apologize for not having more exact measurements, but really, it's hard to mess this up. Feel free to omit the bacon or change up the veggies. Just keep the egg to milk/cream ratio the same and the world's your oyster. Or your quiche. Mix the milk (and cream if using) with the eggs, whisking well until smooth. Add a dash each of mustard powder, salt, pepper, and dried oregano, and stir. Set egg mixture aside. Cook the bacon in a large skillet. Remove when crisp, drain on a paper towel. Crumble and set aside. Fry the potatoes in the bacon grease until sides begin to crisp and brown. Remove from skillet and season with salt and pepper. Line the bottom of a deep dish pie plate with the potatoes. Next layer in the cheese, sprinkling evenly over the potatoes. Saute the onion in the bacon grease, or add a drizzle of oil if it has been used up by the potatoes. Sprinkle the onions over the cheese. 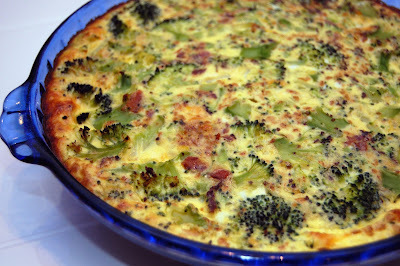 Top with the broccoli florets and bacon bits, then pour the egg mixture over all. Bake on center rack for 45 minutes to 1 hour until center is set. Let stand for 5 minutes, then serve. Reheats well and would probably freeze well too. My woman's group at church will be serving quiche at our monthly meeting in a couple weeks and this recipe would be perfect. Thanks for sharing! Dropping in from FTLOB.oh, this looks delish! I love broccoli. Thanks for sharing the recipe! I'll have to give it a try soon! m'mm! this quiche sounds amazing! i wish i could have it for breakfast! 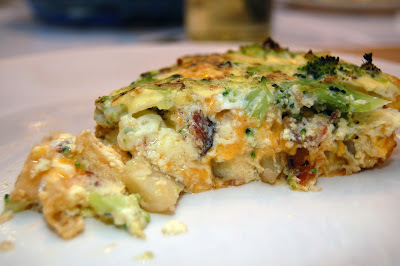 i hope you'll drop by and link this & any other recipe up to mangia mondays!